The OMEGAROMETER Series accelerometers are designed for industrial vibration measurements. These accelerometers feature a hermetically sealed 316L stainless steel case suitable for harsh environments. 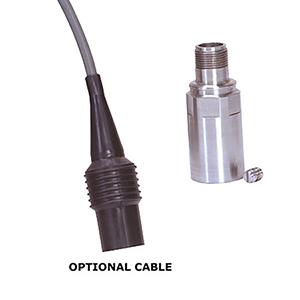 The ACC793 is a high performance accelerometer with a top cable exit. FM and CSA intrinsic safety approval is an available option. 注: 1 A maximum current of 6 mA is recommended for operating temperatures above 100°C (212°F).